Backlog of cases and delay in their disposal were the primary ailments of the system that the National Judicial Policy (NJP) aimed at curing, aspirations of prompt and fair litigation are compromised from the very start; from the moment of a suspect's admission in jail, Advocate Javed Chattari told Kolachi. Fresh off the euphoria of the restoration of the Chief Justice of Pakistan (CJP), Iftikhar Chaudhry, many in the judicial and lawyers fraternity pledged their commitment to the National Judicial Policy (NJP). The National Judicial (Policy Making) Committee-2009 resolved to focus on justice at the grassroots level, so as to ensure that the perennial twin problems of 'backlog' and 'delay' should be expeditiously dispensed with. When the Juvenile Justice System Ordinance 2000 (JJSO-2000) came into being, there was an air of hope and optimism regarding the protection of children involved in criminal litigation. People were hopeful that the ordinance would contribute towards the rehabilitation of juvenile offenders in the society. For the past six months, 48-year-old Samina has been frequenting the corridors of the City Court with her husband and daughter-in-law to bail out her 23-year-old son, Mohammed Faraz, who was caught on charges of committing a robbery. Samina and her family are among the many citizens, usually belonging to low-income areas, crammed inside the court hallways. As more families get together to meet their loved, most share their woes of the expensive cost of litigation with each other, all agreeing that the mere process of taking a dispute to a court of law wears them out, much before the case is actually produced before a judge. Shamsul-Haq is 45-years- old, but the lines on his face make look much older than his age. His hair is matted and there are several droplets of sweat on his forehead. Sitting on the courtyard of the City Courts, he seems irritated and tired. Upon entry at the Central Prison Karachi, a new inmate is greeted at the office of the "Marri," Chattari narrated. The inmate is then "interviewed" by the "Muqaddam," a man described among prisoners as the "don" of the jail. The same placement in Landhi Jail is known as "Patel," but ultimately, both are appointed by the jail administration, he claimed. A Muqaddam, Chattari described, is not a permanent entity; he changes from time to time, and is also called the "jail bird" because he is posted and removed. The Muqaddam remains important to jail administrations, however, as they are hardened criminals who are employed to extort money from inmates. In return, the Muqaddam gets his commission-based cut. The Muqaddam's primary weapon is psychological warfare, revealed well-placed sources. This starts with the "interview," in which a complete biographical assessment of the inmate is carried out. This includes family details, vocation, influence, and bank account(s) details. The status of the inmate depends primarily on how much money he has to spend, and while the more fortunate pay their way through, most new prisoners are "awarded" a whack on the face. This humiliation is followed by forceful directions to clean the insides of a water tank filled with grimy water, before sweeping the entire place, sources said. The inmate is then asked how much money they can afford while in prison. For those willing to shell out a fee, different service options are available. Those who can afford between Rs50,000 and Rs0.5million are sent to Dar-ul-Quran. The highest category is that for industrialists, who have to pay anywhere between Rs0.5million and Rs5million for a luxury stay at the jail, with provision of services such as butler, cooked-to-order food, protocol, television, cable and, air-conditioning. The poor are not as fortunate, literally and figuratively. Between Rs5,000 and Rs20,000 are charged to simply prepare a charge-sheet for an inmate. The psychological and physical humiliation that greets a new inmate is usually enough to force the family to pay money for their dear one. If the Muqaddam is somehow not paid, the production file of the inmate mysteriously disappears; once it vanishes, there is a good chance that the case will remain in cold storage for quite a few years, sources said. The presence of judges inside courts is the basic setting for any case to be heard, but some times, judges are away on other engagements (such as training), and this compounds the matter of cases backlog, Chattari said. Judges ought to work from 9am to 3pm, during which they are supposed to hear a minimum of 70 cases every day. "The six-hour duty time, however, includes lunch and other miscellaneous breaks, and thus, hearing the stipulated number of cases becomes next to impossible. There is a shortage of judges, and that needs to be addressed," Chattari said. The judges' exertions become cumbersome as they don't have any trained staff, the advocate said, adding that most verdicts, bail orders, interlocutory applications, witness depositions, disposal orders or any other orders are personally put in writing by the judge, and this wastes precious time of court proceedings. "There should have been a high court institution, lower court institution... preferably a judicial academy to train judicial staff, but nothing exists," Chattari argued. While judges remain a victim of systemic inadequacies, prosecution and defence counsels seem to make hay of the situation. Allegations are commonly raised against pubic prosecutors regarding acting arbitrarily, and even, that they are bribed one way or the other. These allegations remain unproved, but regardless, are heard repeatedly in numerous case hearings. A UTP has to be produced in the court twice a month, and every time he has to pay Rs1,500 regardless of whether the case is heard or simply adjourned. Despite this, there seems to be coordination among lawyers of opposing litigants, as at least one of the lawyers remains in absentia at the time of hearing, and a judge had to give another date. When defence counsel doesn't show up, or turn up late, they usually turn to grounds such as traffic gridlocks in order to ensure that they are not found liable of contempt of court. Different rates are charged for different kinds of litigation, a lawyer, requesting anonymity, told Kolachi. "The three major criteria of deciding the case fee are nature of case (heinous crime, petty crime etc), urgency (is it necessary to expedite court proceedings), and the financial stature of the defendant," the lawyer said. The lawyer maintained that the minimum fee charged for each case is Rs25,000. A competent and thorough lawyer, as per this rate, manages to earn between Rs0.5million and Rs2million per month, the lawyer said. However, much of this fee is used in running the affairs of their offices. There are two major reason for witnesses not making it to court, said Chattari. What often happens is that the process server doesn't serve the notice to witnesses, and simply provides a report in court that no one was present at the address mentioned, he explained. Secondly, Chattari said, when making a charge sheet, the investigation officer (IO) fills in five or six fake witnesses. Since the witnesses are fake, obviously the addresses written are also bogus. In case some witness arrives, then IOs harass and torment them, in a bid to ensure that they don't return. In such a scenario, judges have to keep a check and balance on the system, Chattari said. Case property is usually stored in the court storage, also known as the "Maal Khana," Chattari narrated. The in charge of court storage is known as the head Moharir, who is responsible for entering case property into a log, Register # 19, because they can be expensive and even explosive. Nobody else can operate the Maal Khana other than the head Moharir, but if he is absent, then the case property cannot be produced in court, Chattari said. Sources meanwhile alleged that the IO operates in connivance with the head Moharir. When the case comes in, the IO is responsible for preparing the charge sheet and handing over case property to the head Moharir. The IO has to get the case property received by the head Moharir, a process called "Madd," wherein case property is serialised in numbers before storage. In theory, the case file should then be handed to the prosecution. In practice, this doesn't happen, sources claimed, as the head Moharir simply says that he has no space to store case property. Sources alleged that the IO has to pay the head Moharir between Rs1,000 and Rs2,000 for each case, with the cost ultimately shifted on the accused, sources said. Court staff includes the categories of reader, Pattay Dar, and clerks. The mechanism of hiring is not open, however, and most of these vocations operate as ancestral professions, sources told Kolachi. Sources alleged that court staff operates as a mafia, who even "sell" honest judges, without them even knowing that deals are being struck on their behalf. If a deal cannot be struck with court staff, the accused, their family, witnesses, and even lawyers have to bear insults at the hands of the court staff, who also ensure that the case is trapped in red tape and more complications are created. Court staff operates on a pool system of earnings, sources continued, with money put into a pool and equally distributed. Each staff member earns between Rs500 and Rs2,000 every day. For an ordinary notice, a bailiff charges between Rs100 and Rs200, but if the case is to be expedited, more than Rs1,000 are charged from the accused. Each bailiff has the same number of cases that a judge is processing, and hence, the margin for earnings is significant, sources alleged. It is disheartening to know that there is no one who can speak fairly in a court of law, said Khalil Ibrahim, the brother of a man named Munawwar who has been imprisoned for the past four months on charges of selling a stolen car to someone. "It is not that I am asking for royal treatment for my brother, but at least the process of investigation should be fair," an irritated Khalil told Kolachi. "No one is taking my brother's version into account, who has been telling the authorities over and over again that they are not looking for the person who sold the stolen car to him in the first place." Khalil said that his mother accompanies him to the City Courts at every hearing, as she refuses to sit at home and insists on meeting Munawwar. "It gets difficult in her presence, because if someone asks for money she asks me to give it to them without arguing so that we can meet my brother," he said. "If we don't do that, they may beat up my son in prison," Khalil's mother interjected. Both brothers used to work at a tea shop at Landi Kotal Chowk in North Nazimabad, Khalil narrated, claiming that they would earn about Rs1,000 every day. After Munawwar got involved in this case, however, the tea shop started faring very badly. Of the previous returns of Rs1,000, Khalil is now left with Rs300 for his family. "After my brother got into this case, I have to do petty jobs so that we can pay people on our way to meet him. I realized quite early in my conversations with the guards and other staff that without money, they are not going to let us meet him, let alone getting his case file forwarded," Khalil said. Both Khalil and his mother narrated that there was supposed to be a hearing for Munawwar's case, but no one showed up. "I am sitting here with my mother since 10 am, and it's time for lunch now. This happens every time we come here for a hearing. We are asked to show up in the morning, while the judges, policemen and even the lawyers walk in after 1 pm. Addressing a seminar held recently at the Karachi Bar, former judge of the Supreme Court, Justice (retd) Nasir Aslam Zahid presented the statistic that on January 31, 2010, the number of cases pending in subordinate courts was 1,366,404,while the total number of judges in the subordinate judiciary was merely 1,969. These figures pertain only to major cases, and do not include bail applications, and other miscellaneous applications such as tax cases, revenues cases and others. Zahid stated that the conviction rate in the country for criminal cases is barely 10 per cent. The CJP had categorically stated that cases lying pending till 2008, as well as cases lodged in 2009, should also be disposed of by fifty per cent by the end of 2009. Fresh cases, he directed, should be concluded within six months from the date of institution. Taking into considerations the observations made by the CJP in accordance with the NJP, cases were indeed disposed of at the grassroots judicial level in pursuance of the NJP, albeit without fulfilling legal requirements, noted various lawyers and judicial experts. There were also cases wherein both the accused and the accusers expressed disappointment over the verdict given, and sought justice from the Sindh High Court (SHC). The prime example of this phenomenon can be seen in both the counter and main cases related to the assassination of slain chairman of the Pakistan People's Party-Shaheed Bhutto (PPP-SB), Mir Murtaza Bhutto. Acquittals in both the counter and the main case raised many an eyebrow, given that no one - not even the judge - disputed that Bhutto and his six comrades were killed. The judge in his remarks observed that the investigation completely failed to bring the guilt on book, and there were lapses on the part of investigation team. The verdict exonerated both the accused party and the aggrieved party, in both cases, of murder charges. While the case was disposed of after 13 years, but the legal remedy could not identify the murderer(s). The judge was empowered under Section 250 of the Criminal Procedure Code (CrPc) to take action against the complainants over false, frivolous or vexatious accusation, and thus, the aggrieved party filed an appeal in the SHC, seeking justice from the honourable court of SHC. Another significant example was that of the double murder case of Justice Nizam. The accused managed to be acquitted from the SHC, and later, were appointed at key positions in the government. No other suspects are being tried in the case. Where the judicial and legal fraternity failed, insofar as implementing the NJP in letter and spirit, was the non-production of under-trial prisoners (UTPs) from jail. About 2,500 production orders were released by the honourable courts, but not more than 600 UTPs were produced. The reasons attributed to the delay in production of UTPs by the authorities concerned were shortage of transportation facilities and the lack of police strength. Ultimately, most UTPs could not be produced within the timeframe stipulated by law. Many UTPs reportedly sent applications to the CJP regarding their non-production in a court of law for several years, many claiming that this was so because they were unable pay 'Bhatta' (extortion money) to jail superintendents. Some even alleged that the money extorted from UTPs totalled in millions, not even thousands. These applications, in high probability, did not reach the office of the CJP. Insiders claim that the post is prevented from reaching its eventual destination by jail authorities, or postal officials working in connivance with senior jail staff. Sources told Kolachi that about 650 UTP applications, complaining about the delay in their production, were torn-up by various jail authorities. Frustrated inmates also protested against the lockup police working at the City Courts, who had brought about 300 UTPs for their hearings, but only 169 of them were produced before the judge. The rest were simply taken back to prison, without being tried in the court of law. Other contributing factors for the delay in disposal of cases include the division of courts into civil and criminal courts. This has put a burden on the criminal side, as more than 100 cases are listed in the cause list. In comparison, only 10 cases are scheduled in the cause list at the Civil Courts. This becomes more pertinent if one notes that about 150 fresh cases are registered on a daily basis in more than 100 police stations of the city. Experts believe that in a scenario wherein every citizen lodges complaints with the police, the judicial system would come to a virtual collapse, as merely a fraction of all cases have been disposed of. The filing of miscellaneous applications under Section 491 of the CrPC, and Section 22-A, were also entertained by judges. However, it is the responsibility of the police to entertain private complaints and exercising their powers under Section 54 of the CrPC to register an FIR, and take appropriate action. With enabling sections embedded in the ordinance, including the formation of exclusive juvenile courts, separate proceedings for children, prohibition of handcuffs and corporal punishment on the child, it was thought by many that a juvenile lawbreaker will become responsible citizens in future. Ten years down the lane, however, the situation is no different from where it was before the ordinance was instituted. The concept of separate juvenile courts appears to exist on paper only, and it becomes clear that the implementation of the ordinance never took place, as even today children are tried along with hardened criminals, hands tied in iron chains. According to a population statement on February 22, 2010, there were some 11 convicts and some 169 under trial prisoners lodged in the Youthful Offenders Industrial School. "Children who end up behind bars even once have a tendency to become criminals when they come out, primarily due to the fact that they are treated no differently to adults," complained Advocate Ghulam Madni, the provincial manager of the Juvenile Justice, run by the Society for The Protection of the Rights of the Child (SPARC) . "There is hardly any implementation of the JJSO in the courts. If the government can not ensure the implementation of such laws, then it should not make them in the first place," he complained. Former judge of the Supreme Court, Justice (retd) Nasir Aslam Zahid told Kolachi that justice cannot be provided to juveniles until and unless separate courts are formed for them. "That is not a priority for the government. Even though several years have passed since the ordinance came, but the government has been unsuccessful in establishing separate courts for juveniles." Zahid felt that the judiciary should pressurise the government to release funds for setting up juvenile courts. "To ensure that a proper justice system exists for juveniles, the process is long and difficult. Not only are courts required, but judges and lawyers need training regarding the handling of such cases. Also, there is a dire need to increase the strength of lawyers and judges fraternity so that cases can only be handled by the specialised juvenile judges and lawyers." While there is a need to increase the number of legal representatives, the strength of probation officers must also be raised, as they are the ones on whose recommendations the courts release juvenile prisoners on probation. 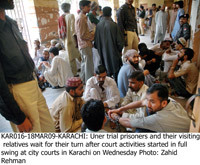 In a seminar held week at the Karachi Bar on JJSO, Justice Musheer Alam of the Sindh High Court (SHC) said that there is only a single probation officer working in Karachi, which is why many juveniles are deprived of being released on probation. "The role of a probation officer is very vital as he submits a report on the character, social, moral and educational background of the child, and recommends his probation. Then, during the child's probation stint, the officer keeps check on the juvenile once he is sent home to become a productive member of the society. But this hardly takes place due to the fact as there are only 3-4 officers in Sindh," Zahid said. He said that many of the accused are first-time offenders, and should be released as the court and jail environment for them is not healthy. An advocate of the SHC, Salma, concurred and said that when a child mingles with criminals in court rooms, he starts behaving like them and doesn't remain a child anymore. While lawyers and representatives agree on the total implementation of the JJSO, a big question mark lies over the future of these children, who, despite having a piece of legislation in their favour, are being deprived of their rights. "When we first came here for the hearing, we had no idea about how things worked, and as a result, we had to bear the insulting attitude of everyone -- from the Hawaldaar to the Patwari, everyone. After six months of going back and forth these corridors, it has become obvious that money is the cure for all problems," Samina quietly told Kolachi. Extracting her lunch of chicken and Roti, which she especially cooked for her son, Samina maintained that compared to the amount of money one has to move applications to the right person, her husband's meagre salary is simply not enough. The family lives in Liaquatabad, and everyday, they have to spend between Rs500 an Rs1,000 to get things moving. "Either it is signing of an application or a stamp paper, or even when we have to meet our son. On our way to visit him, we have to keep giving between Rs50 and Rs100 to court staff, and if we complain, we are told in insulting terms that this is how it works," she said. At this point, Samina's husband, Mohammed Aftab, a haggard looking old man in his early 50s, told her to keep mum, and said that it was their son's fault as well. "He had become an addict, and got hooked up with boys who were not good company to begin with," he said. Aftab, a hawker and furniture polisher, earns between Rs250 and Rs500 at the end of the day, depending on the hours he puts in at both jobs. Pointing towards his wife, Aftab claimed that she didn't "understand the system." "In our country, a poor man has to buy the law to get justice, even if it is for the smallest of crimes. No one understands our financial situation or mental anxiety, the system is hell bent upon punishing us, and those who are guilty are roaming around freely," Aftab said in a low quivering voice, as if being nervous of the guards around him. Aftab narrated that their son, Faraz, being "young and foolish," thought that he would help their financial situation by robbing a house, but blamed himself for what happened. "I cannot work and look after my home at the same time, and maybe it is because of that, that he (Faraz) got into such habits, I don't even know when he thought about robbing a house," he said. The couple told Kolachi that thus far, they had spent around Rs10,000 on their son's case, just to prove that he was not in his senses at the time he was caught. "I have borrowed a lot of money from people I know, and yet, the lawyer insists that to make our case strong and see my son get out of jail, I'll have to do what is required," Aftab said. Hammad Qureishi, an advocate of the high and lower courts, claims that such problems are because no investments have been made in the judicial sector. "When you are providing low-cost justice to people, then obviously such problems will come through," said Qureishi. Explaining the process of the costs that must be incurred, Qureishi says that the First Information Report (FIR), statement of the prosecution and by the witness has to be submitted, and that is basically what earns the lawyers their fees. "One thousand rupees is a must for filing an application in the court, and another thousand goes if charge-sheets and statements have to be submitted." Qureishi claimed that he meets families who want to meet their sons, fathers, brothers, and in some cases, even children who are brought to the courts, and said that he completely understands their plight and helplessness. "I charge less in such cases, and make it up ,from some other client who can afford it ," he said. Meanwhile, 46-year-old Abdul Islam has been coming to the courts for about five months now. Standing amidst other men who had been brought to the court for a number of crimes, Abdul Islam said that he has a construction business in Landhi, which he had set up after shifting to the city from Afghanistan some 15 years ago. He narrated that one day, two policemen came to meet him at his office, and asked him to come with them to Malir police station. "When I asked them was I being taken to the police station, I was curtly told that I have a fake National Identity Card (NIC)." On reaching the police station he tried again to ask them again, but instead of telling him anything, he was thrown inside the lock-up. Later, cops said to him that he was an Afghan citizen and was not allowed to open any business in Pakistan. "I was shocked and felt insulted, as I am running this business for the past 15 years, and all of a sudden, I'm told that I'm an Afghan citizen and my papers are taken away from me. Is this is a legal way of investigation?" Abdul Islam said that after four and half months of being locked up in Landhi Jail and frequently coming to the courts, he has no clue what is going to happen to him. "I have spoken with the Afghan Embassy and they keep on pacifying me by saying that I would get free, but nothing has been done." He said that he feels dejected as his prime purpose of coming to Karachi was to earn a decent living, so that he can help his family move from the war-torn Afghanistan. "Now all the money I had earned goes into these legal proceedings which never take place. Abdul Islam claimed that thus far, he has paid a lot of money to the lawyer who helped him by taking on his case. "Rs5,000 and sometimes Rs8,000 is the minimum cost he has to pay day after day to various people, either to get his case file on the judges desk or to help him get food," he said. "I usually opt for Naswaar, as the food I'm served here is worst to even give to an animal." Qureishi maintained, however, that there is a lot of political interference which makes it difficult for them to work. "It's not as if I'm earning millions from my job; my colleagues and I have to go through a lot to earn money, mostly the judges are on leave or there is a strike of some sort because of which the hearings keep getting postponed; all this gets to us as well, as we do not have a fixed salary." He refuted the claim that lawyers pocket more than half the money that needs to be invested in the case and said briefly that he is more into completing his job and insisted that the political environment inside the courts is responsible for the corruption that has become rampant in the past few years. "There have been times that I have demanded extra money form people but that is my job, tell me how to earn money honestly and I'll do that job," Qureishi said. Tired of waiting for the ones who at the helm of power haven't taken a decision regarding his case, making him wait silently and helplessly. Seven precious years of his life have gone by by simply waiting for the decision. "I don't know when the judges will pass the judgment. I am very tired. My life has come to an end where I am clueless as to what lies ahead and how many more years will I keep on spending behind bars. " With hands tied in iron chains along with two other prisoners, he tries to gulp down daal chawal down his throat with much difficulty. "My family does not come to see my any more. I can't recall the last time I saw my wife," he says with a small smile, a smile hiding sadness and the acceptance of his fate. Haq has been charged under section 302 for the murder of a mentally retarded person in his neighbourhood. "One morning back in September 2002, I was arrested and charged with murder of my neighbour. But I am innocent. Someone killed him and threw his body just outside my home. My only fault was that he was found lying on my threshold in Aisha Manzil,"
A tailor in his previous life, Haq becomes excited when he talks about his family. "I have three children and they are all grown up. I wish I could see them. I wasn't there at my daughter's weddings or seeing my eldest child learning my profession and sewing clothes. My family has moved on with their lives, and I am now alone, living my own. Life changed a lot after I came to the prison." Haq, whose case is be run by a state lawyer, blames the counsel for the delay in his case, as according to him, the lawyer frequently skips the hearing dates and is not serious about the case. "I am a poor man and cannot afford a private lawyer. The Sarkari lawyers here come at their own will and are not doing justice to the poor people. People like me have no one to go to." Learning Arabic at the jail, he concludes his talk by saying, "I miss my home a lot and wish I could go back to them." Behind the smiles of Jenety and Mahesh is the longing for their homeland and the urge to unite with their respective families. It has been three months that these two Indian fishermen have been detained at the Youthful Offenders Industrial School (Juvenile Jail) for crossing into the Pakistani waters and have been waiting since then for the court to take up their case and decide their sentence for border-crossing. Meanwhile, the Provincial Manager, Juvenile Justice of the Society for the protection of the Rights of Child (SPARC) Advocate Ghulam Madni has filed a petition in the Sindh High Court, demanding swift action on the case. "Since the last three months, these children have been languishing in the juvenile jail as the court is yet to take a decision regarding their charges. Now who will compensate for the time lost in simply waiting for the judges to take a decision regarding the case?" he questions. Caught by the Pakistan Maritime Agencies while fishing in the Arabian seas, Madni is also concerned about the time they will spend once their sentence is served. "Due to the bitter relations between the two countries, the prisoners in each other countries are not released on time. God knows when these two children will be given the verdict, when will they complete their sentences, and when they will be able to go to their homeland safe and sound." Hailing from a village 'Pur Bandar' in the Gujarat district, Jenety Dewa was caught last year on December 4, and Mahesh Meg on 19 December. Having difficulty to converse in languages other than Gujrati, 18-year-old Mahesh is quick to point out that there is no boundary in the waters which distinguishes the Indian border from the Pakistan one. "There is no border or line which demarcates the both the countries. How are we supposed to know which sea is ours and which Is Pakistanis when there is no mark?" Mahesh's brother was also caught in the boat along with other fishermen and has been detained at the Landhi jail since then. "I haven't seen brother since then. I really miss my family a lot and cannot wait to get back home," he said in a sorrowful tone. On the other hand Jenety says that he never thought that one day he would be in another country behind bars for no valid reason. "It is not our fault if there is no demarcation in the seas," he said adding that life in the prison is difficult and he passes his time by learning handicraft and the other technical work such as fixing light bulbs.